Nannie Helen Burroughs, by Rotograph Co., New York City, 1909. 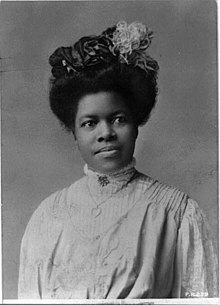 Nannie Helen Burroughs (May 2 1879 – May 20 1961) was an influential African American, author, educator, orator, and religious leader. For a number of years there has been a righteous discontent, a burning zeal to go forward in His name among the Baptist women of our churches and it will be the dynamic force in the religious campaign at the opening of the 20th century. How the Sisters Are Hindered from Helping September 1900 National Baptist Convention. Speech given at 1900 National Baptist Convention, Richmond Virginia. This page was last edited on 24 August 2018, at 20:38.